Visutech wanted to present the opportunities of changing data and mosaics at its fair department. A solution was found with attention-raising free gifts that were implemented with the efficient cooperation between three companies. Westpak printed a batch of personalised sweet bags with the HP Indigo 20000 digital press delivered by Visutech. Finnsweet Oy responded to demand and was able to flexibly deliver a smaller batch of marmalade sweets. The company packed the sweets in Westpak’s flow pack packaging, and the completed sweet bags were delivered to Visutech in less than a week from when the printing material had been received by Westpak. Westpak’s digital press printed sweet bags for the event, which had a total of 1,001 different print style variations. The packaging texts approached people with e.g. greetings in different languages. Each bag also included a QR code directed to HP’s website, which offered further information on digital printing to the fair visitors whose sweet tooth had been satisfied. The implementation worked: The sweet bags that had been printed by Westpak and had presented the opportunities of changing data and mosaic raised a lot of attention among the fair audience. The fair’s sweet bags are just one example of the various uses of digital printing. When your company is launching a new product, wishes to strengthen the brand value of an existing product or is simply looking for something new and different, we recommend familiarising in the diverse opportunities offered by Westpak’s digital printing technology. Digital printing enables the print style of each packaging to be different, and even small print batches cost-effectively. Technology also reduces our customers’ risk in launching new products on the market. Trade fairs and other large events that raise attention among Finns are excellent opportunities to utilise personalised packaging, which easily raise interest among various target groups. Digital printing offers an entirely new way of building campaigns around a product. We can attach, for example, a unique code to all packaging, which can be used to direct the consumer to a separate campaign site. In this way, added value and content can be provided to the purchaser of the product. At the same time, the manufacturer has access to valuable data, such as for example the consumer’s contact details, which can be utilised e.g. in post-marketing. The added content packaging enabled by technology are an unseen way of reaching the consumer generation that is used to the ability to share everyday life. We can print, for example, the consumers’ own images on the packaging. The phrase is old, but the printing technology is new: only imagination is the limit in case of digital printing. Westpak delivers the entire packaging to its customers, not just the printing. We combine the perfect print quality of digital printing and the marketing opportunities it offers with our technical know-how and high-quality film materials – uniquely in Finland. How could our digital printing serve your company? Familiarise in the packaging options or contact us directly. 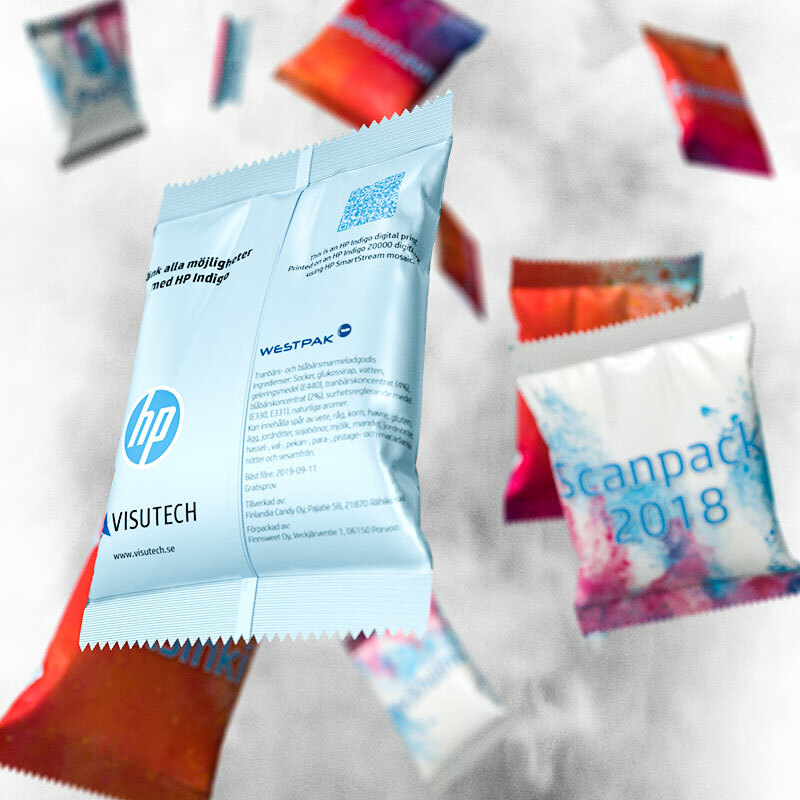 Visutech was established in 1988 and is a Swedish import company operating in Sweden, Finland, Norway and Denmark, which delivers all graphic design devices and digital solutions to the Nordic market. The company has worked in close cooperation with HP since 1994.